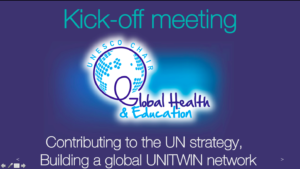 Forty participants from all over the world participated in the kick-off meeting of the UNESCO Chair Global Health & Education. The event took place in UNESCO headquarters in Paris, on 26-27 February 2018. The main goal for the kick-off meeting was to meet with the key partners of the UNESCO chair and to find common ground for the UNESCO chair activities that will be the basis for our work plan for the next four years. The meeting was made possible thanks to contributions from the UNESCO, Clermont-Auvergne University, the French Ministry of Health, the Interministerial Mission for Combating Drugs and Addictive Behaviours (MILDECA), the International Union for Health Promotion and Education (IUHPE), the French League against Cancer and PREV 3.0. The report contains a summary of the key note speakers and discussion on the work-plan. Find the report here. You can access the programme of the meeting and the PowerPoint presentations of the key note speakers. Find the presentations here. The brochure of the UNESCO chair in available here. The official launch of the UNESCO chair is scheduled on 10 October 2018 in Paris.